According to the latest edition of the NPD Solarbuzz photovoltaic devices quarterly report pointed out that in 2011 the Chinese mainland and Taiwan solar cell makers maintain a superior position in the top ten accounted for eight seats. Mainland photovoltaic cells companies JA Solar ranked second, the Suntech decline finished third, the Yingli ranked fourth, fifth Trina Solar, Artes ninth. Trina Solar is once again the agency nominated optimistic. 2011 top ten of crystalline silicon and thin film battery manufacturers in the standings and its ranking 12 months ago only a little change on the list only a thin film photovoltaic manufacturers FirstSolar won the first position. Production of 10 photovoltaic cells manufacturers accounted for 40% of global output fell by 4 percentage points compared with 2010. 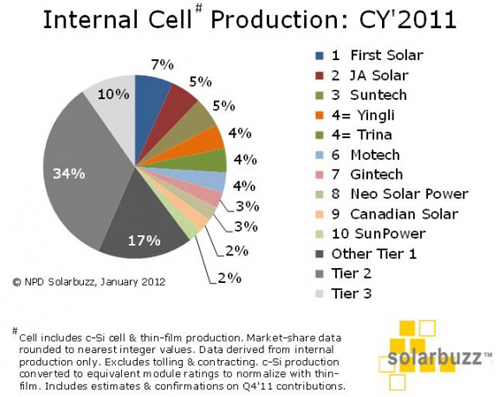 Although some pv cell manufacturers to gradually withdraw due to lack of competitiveness, but the output of the top ten vendors accounted for but also declined, although this phenomenon seems more strange, but it also reflects the 2011 tried to enter a large number of mainstream manufacturers. In early 2011, more than 350 crystalline silicon and thin film PV manufacturers production target from the tens of MW to 2 GW. Although only a few second and third tier PV manufacturers are able to reach their ambitious goals, but their overall optimistic expectations (annual production growth rate of 33%) became the over-supply of the catalyst, and make 2011 the average selling price fell quickly. In the past, the photovoltaic cell manufacturers because shipments of higher rank to enhance the brand value of joy, with the decline of market prices, however, manufacturers are now more emphasis on cost leadership. Taking into account the cost structure of PV manufacturers to jointly decided by the internal production and outsourcing, which means that changes in the ranking of the internal production cost structure is relatively small. However, the internal production of the statistics of each photovoltaic cell manufacturers (including crystalline silicon photovoltaic cells and thin-film photovoltaic cells), can still provide some important indicators to measure the 2012 midstream manufacturers of photovoltaic industry manufacturing is in good condition. In 2011, has many of the transfer of the comments on the battery manufacturers in the industry in Japan, Europe and North America. For these companies, the challenges of 2012 are still comparable, because the manufacturers of the Chinese mainland and Taiwan will continue to affect the terminal market leading cost advantage. Third-party OEM and contract manufacturing once again become a major feature of the 2011 crystalline silicon industry dynamic. Production and excess production environment makes the front line of the vertical integration of crystalline silicon PV manufacturers can choose the capacity of internal production or use of second-tier (or Taiwan) photovoltaic cell manufacturers to OEM. In 2011, although most first-line battery manufacturers have sufficient internal capacity to supply all the components of demand, many manufacturers use a very low spot market price of outsourcing up to 30% of battery production. FirstSolar in 2011 to break through the tight encirclement, become the only company to challenge the mainstream crystalline silicon photovoltaic manufacturers of thin-film photovoltaic manufacturers. FirstSolar founded a few people to follow the example of the integration of downstream vertical business model, and ramp up production to meet strong internal project reserves. Looking ahead, the challenges of thin film PV manufacturers is how to better and cost a significant reduction in crystalline silicon photovoltaic with a competitor. Taiwan manufacturers in China, Japan, Europe and North America, the strong demand of the downstream components, manufacturers of high efficiency crystalline silicon photovoltaic cells, Motech, Yu Jing and sunlight to keep the world’s top ten position. The photovoltaic cells produced by Taiwan high-quality (high conversion efficiency and high yield) and the low price the combination, and thus consolidate more solid brand image of the industry’s leading. In addition, two battery manufacturers, Sun Branch and DelSolar strong performance in the 2011 top of the ranking by the battery manufacturer. Five photovoltaic cell manufacturers in Taiwan in 2011 contributed more than 3.6GW of cell production, including many at the end of the shipments. solar cell manufacturers in the U.S. antitrust litigation brought an uncertain and confusing atmosphere, the contingency plans of many exported to North America’s leading manufacturers of photovoltaic cells to switch to the production of Taiwan, and therefore at least in the short term to boost Taiwan’s battery The growth of the share of production.